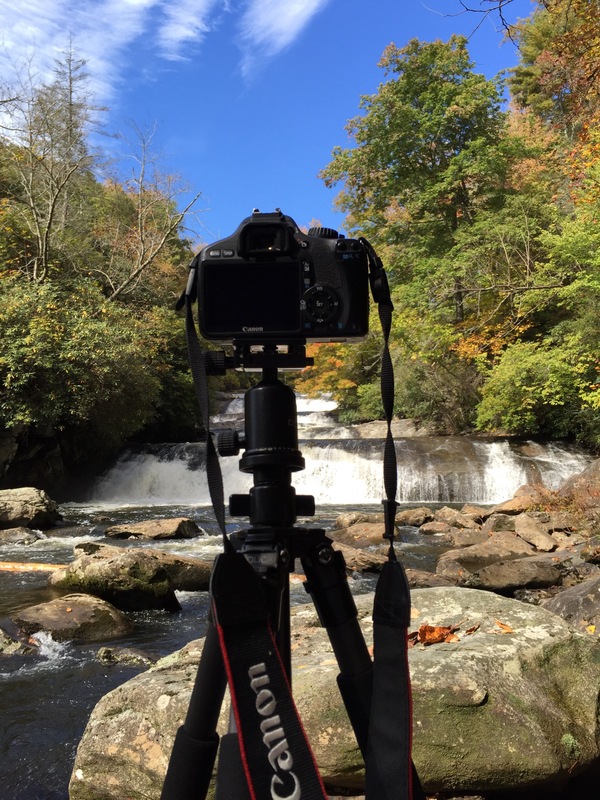 During a recent trip to Gorges State Park in far SW North Carolina, I decided to make Stairway Falls my primary waterfall. 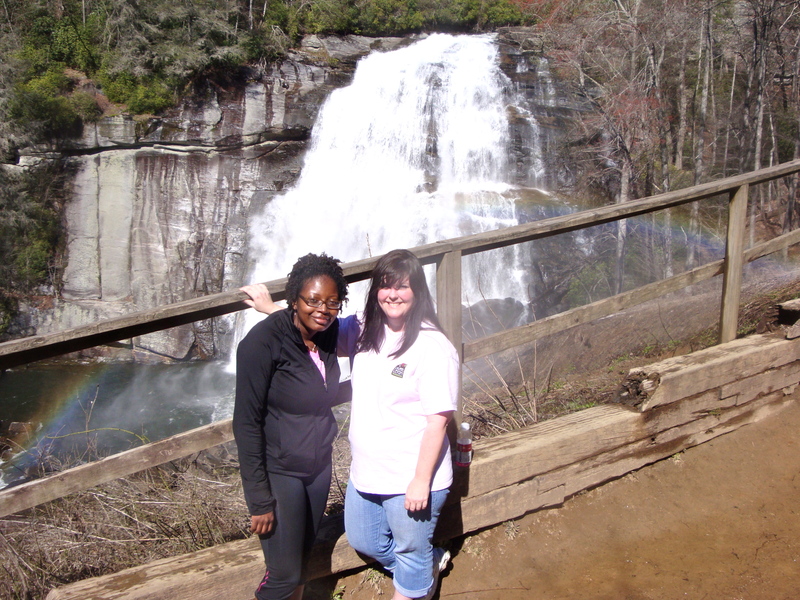 This is accessed off of the popular Rainbow Falls Trail. 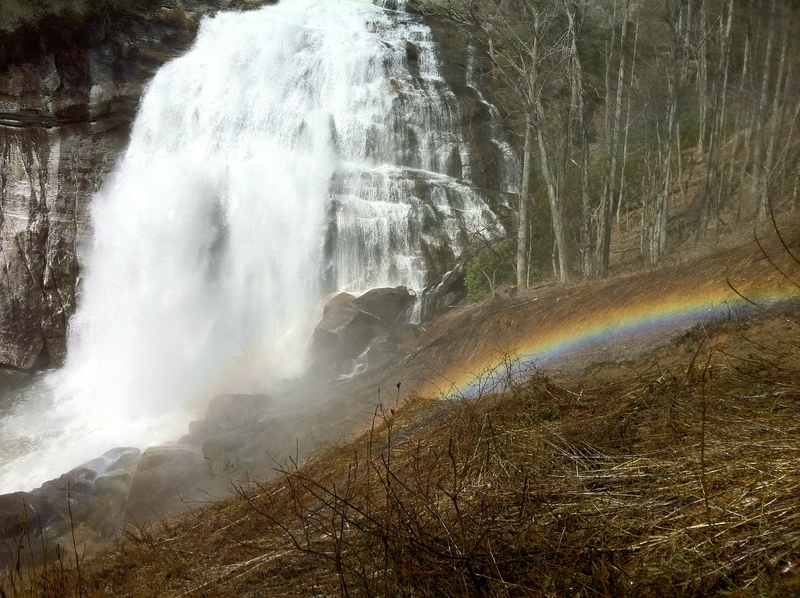 Normally, hikers use this to see the magnificent Rainbow Falls. 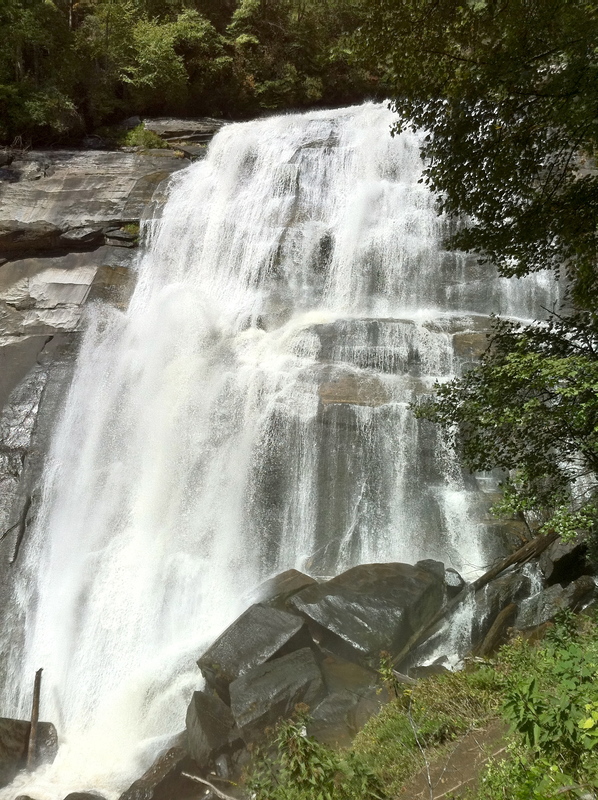 This is done by reaching the river first, and then hiking upstream. 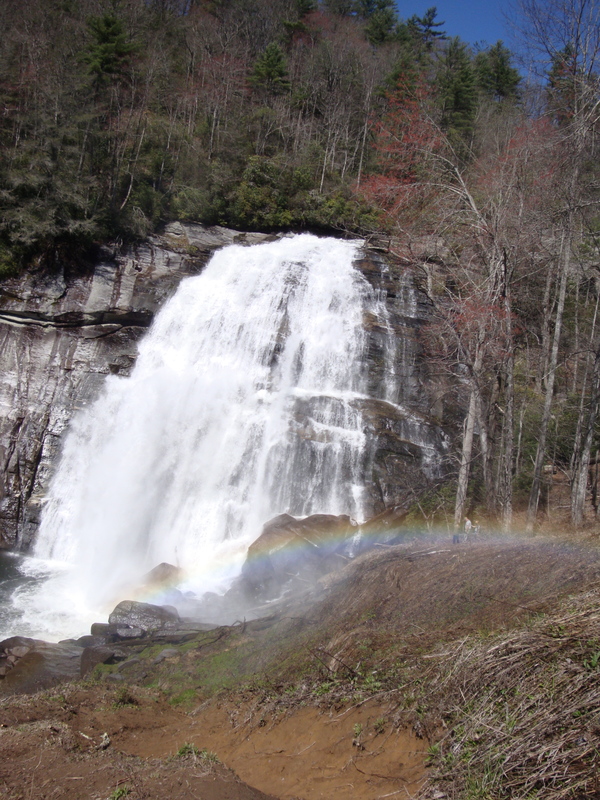 After the wonderful views of Rainbow Falls, most will either head back to their cars, or continue upstream. 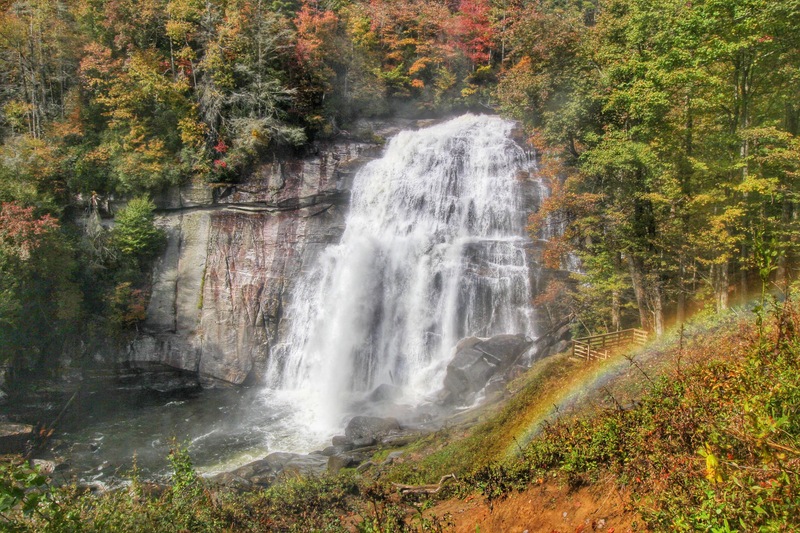 After climbing the steep Rainbow Falls Trail to the top of this 150 foot waterfall, 2 smaller , but but still beautiful waterfalls await. 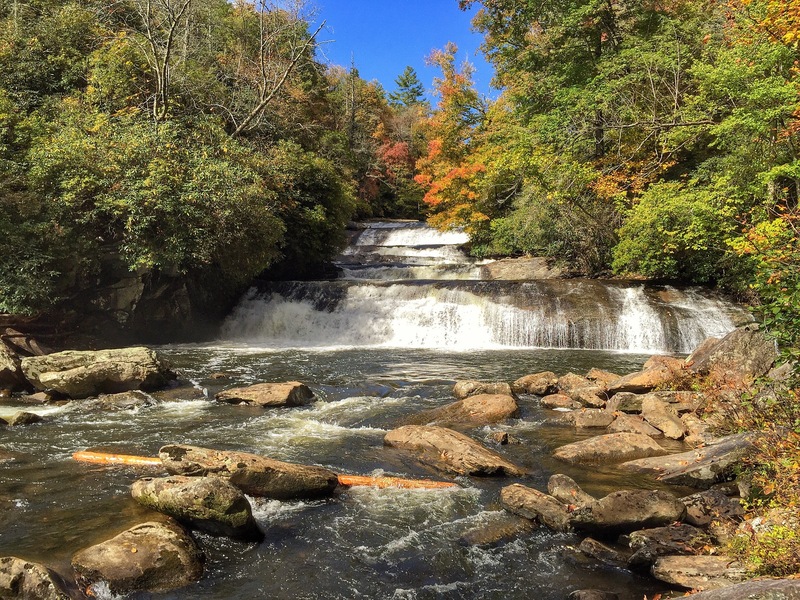 TurtleBack Falls, and Drift Falls, are just minutes upstream and are quite a fine reward for those that hike up the punishing Rainbow Falls. I have done this numerous times. 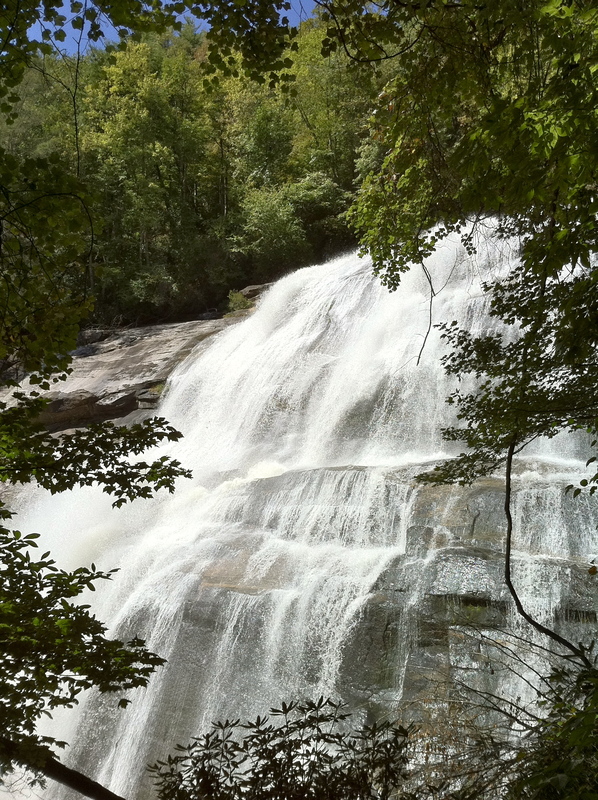 But….there are also waterfalls downstream from where you first meet the river. 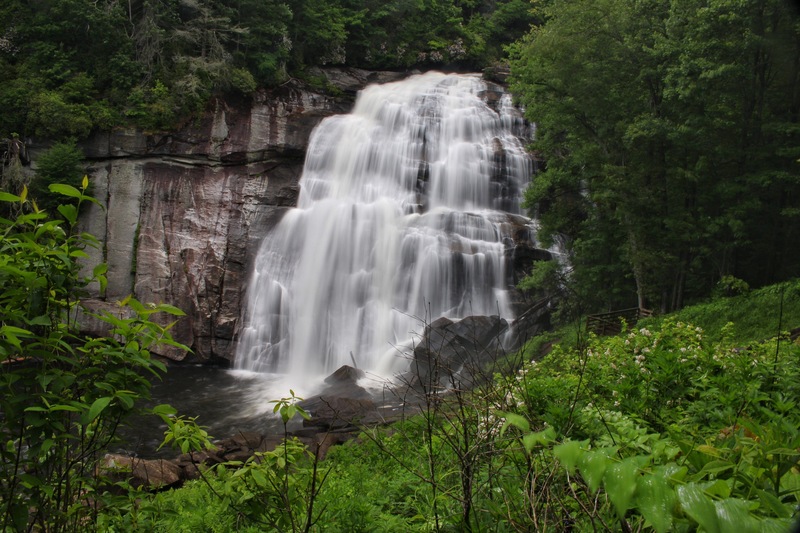 Most avoid this area due to a lack of good trails, and dangerously steep terrain. 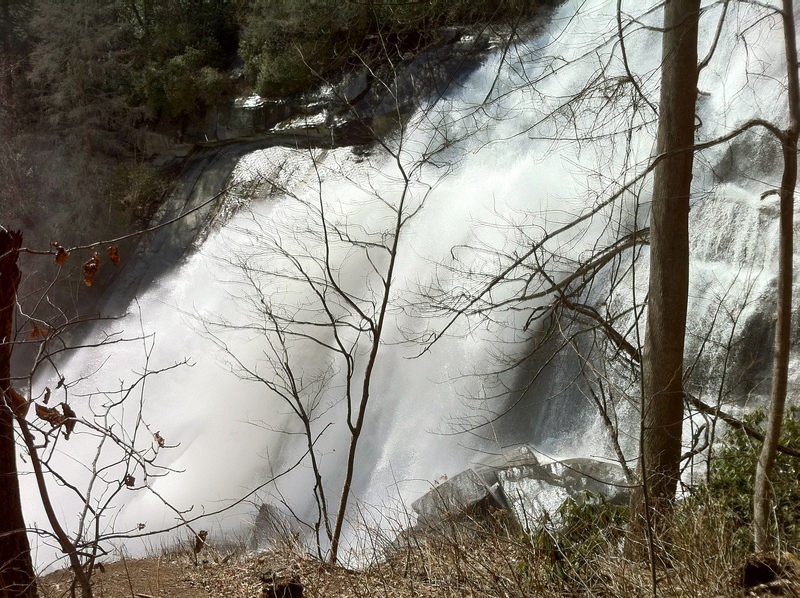 Stairway Falls, Sidepocket Falls and eventually the very dangerous Windy Falls can be seen to some extent downstream. 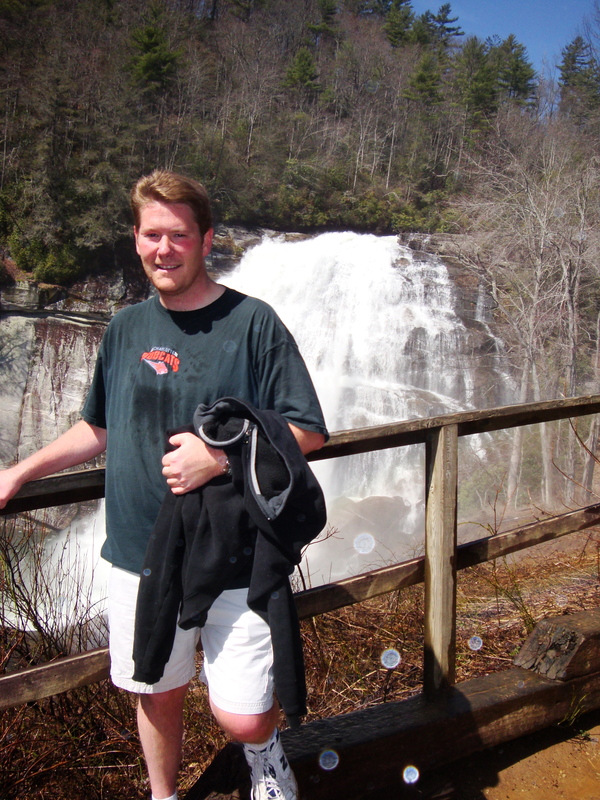 This day I chose to visit Stairway Falls. 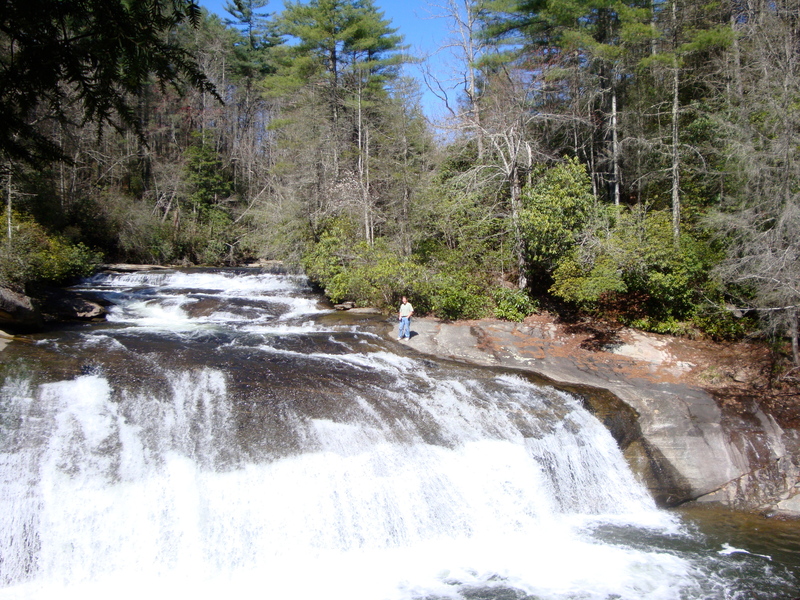 This is the first one downstream, has a decent path, and is gorgeous. 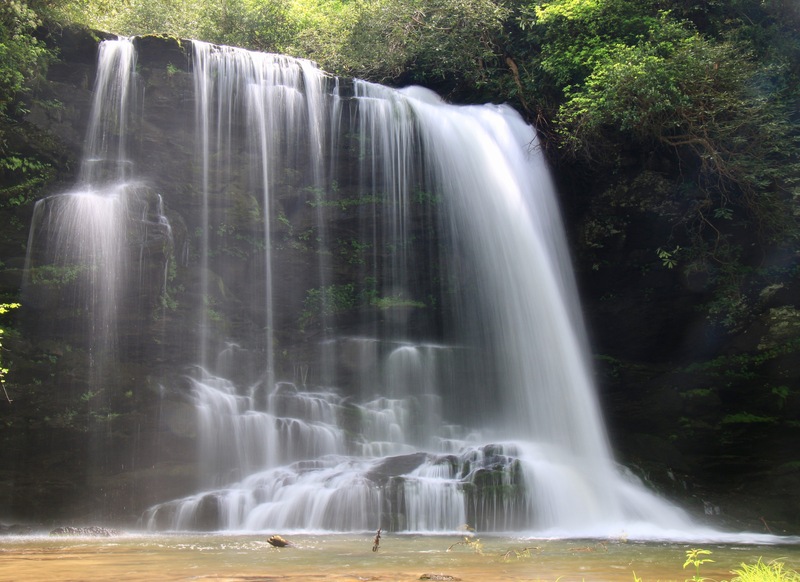 It is a fine addition to my new waterfalls seen in 2014, which is now at 23. 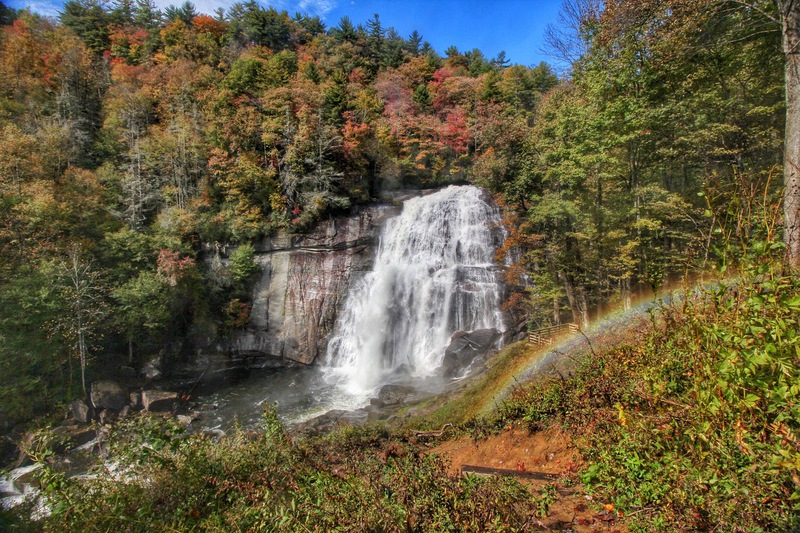 To see more on this, please visit my Flickr album, “New Waterfalls Of 2014”. 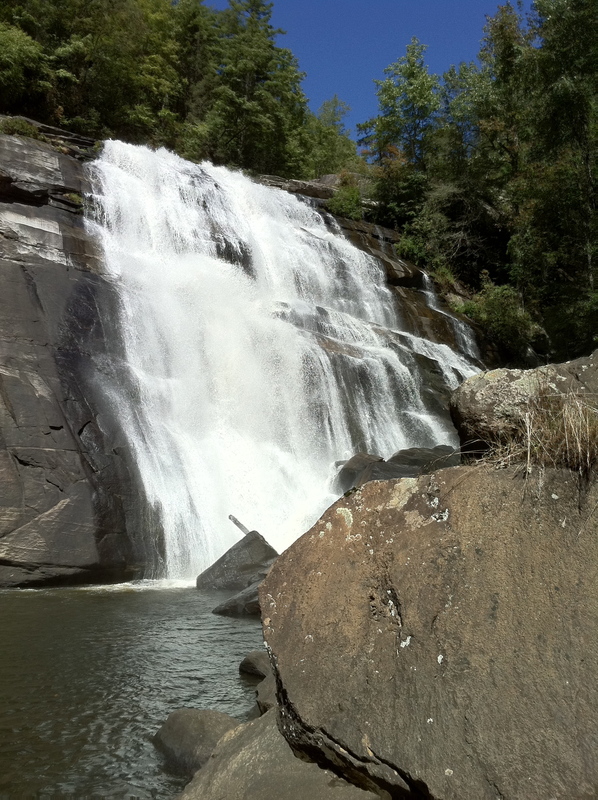 To get here, find your way to The Gorges State Park entrance on NC Hwy 281. This is about a mile past where NC 281 meets with US 64 in Sapphire, NC. Turn into the state park, and I would suggest stopping at the visitor center. This place is only a few years old, and is very cool. The Rangers inside are also very helpful with information here. Once past the center, continue downhill a bit until you see a large parking area on the right. Park here, stretch your legs and get ready for some fun. 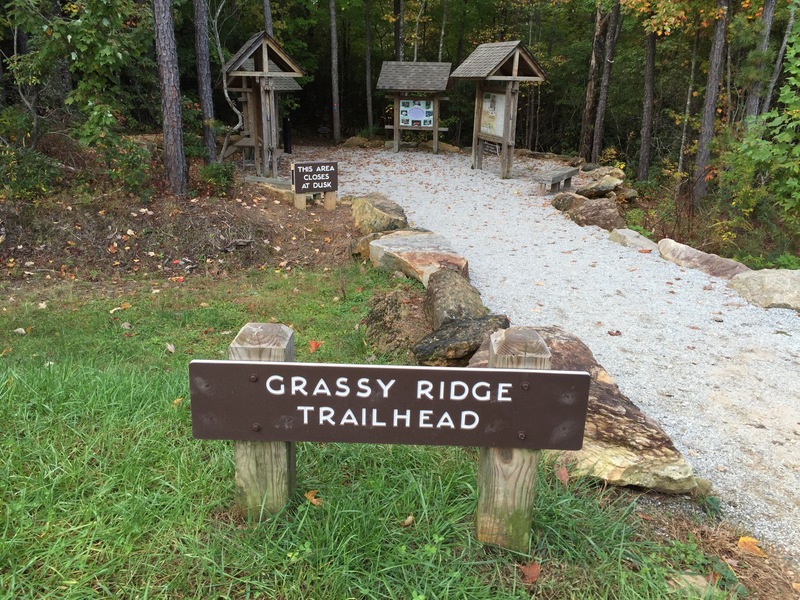 This is called the Grassy Ridge Trailhead, and is access for a number of things and trails. Follow this very nice, wide gravel trail down hill mostly until you reach an intersection. 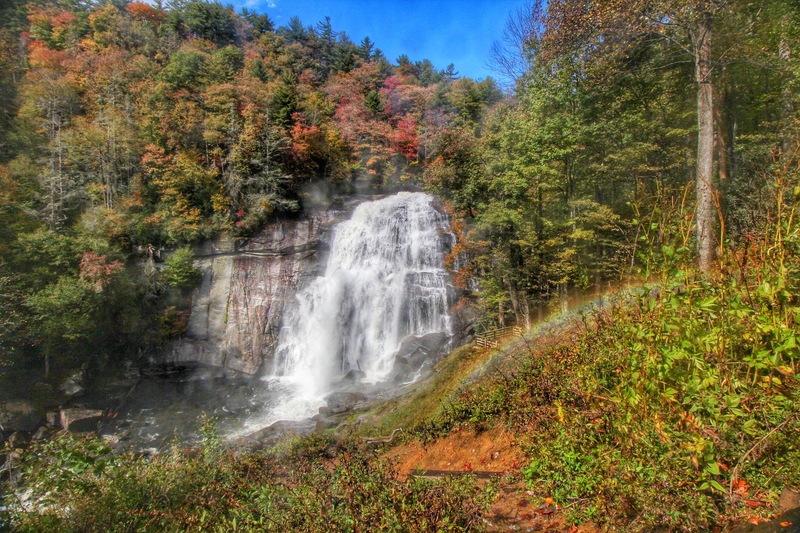 At this intersection, turn right and head down the Rainbow Falls Trail. This is a nice trail that will descend slightly for most of the way until the river. 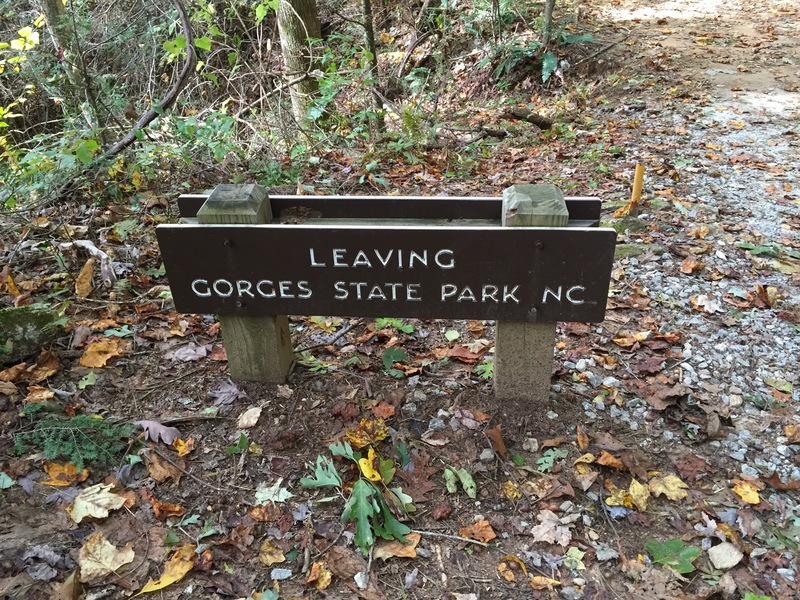 After a mile and a half from the parking lot, you will notice a sign saying that you are leaving Gorges State Park. 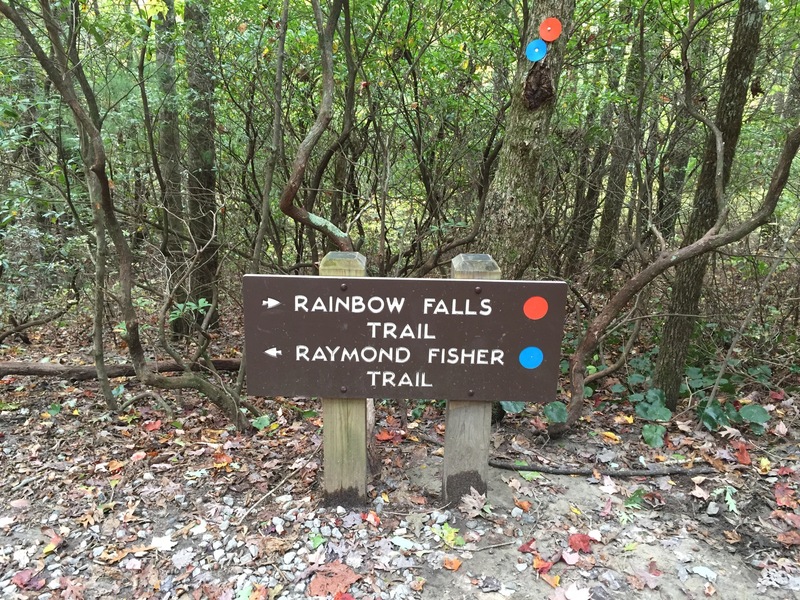 Here is the sign along with a photo of the Rainbow Falls trail in autumn. 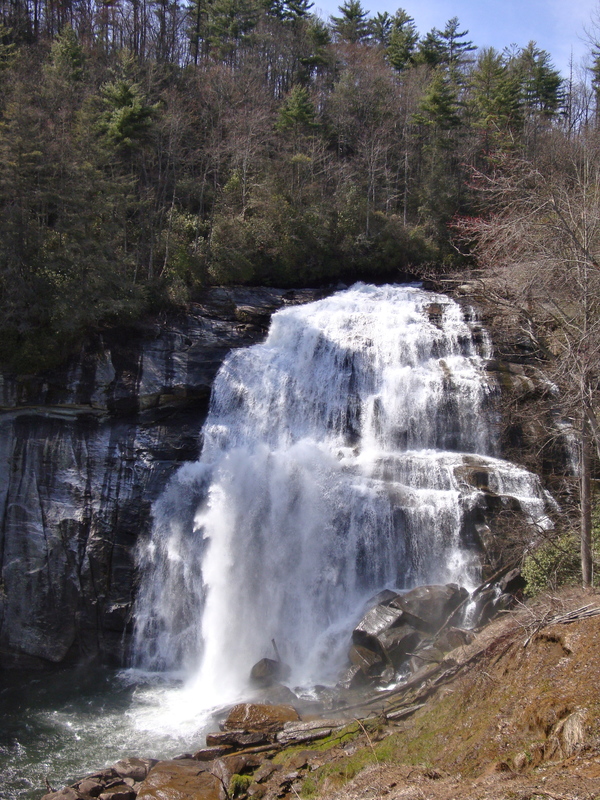 After leaving the park, you will now be in the Nantahala National Forest. 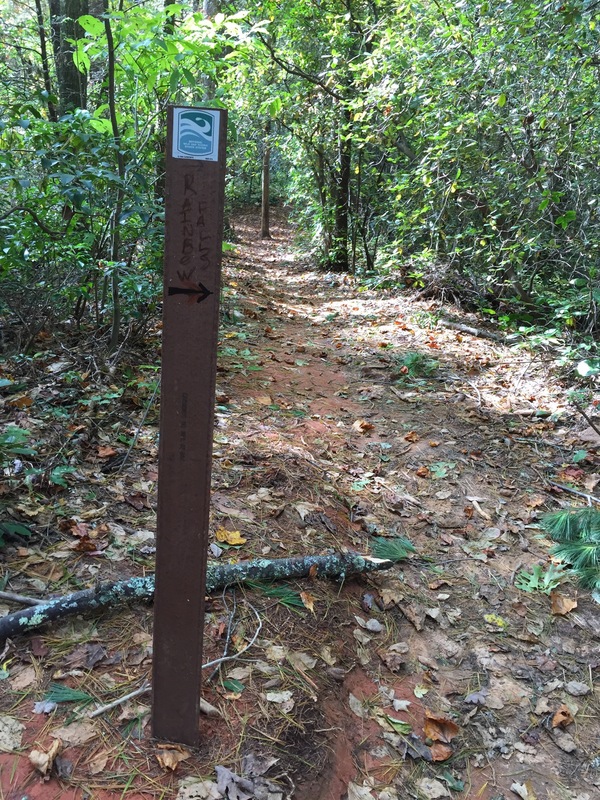 Shortly after leaving the park, there will be a thin, brown, carsonite sign on the left side of the trail. 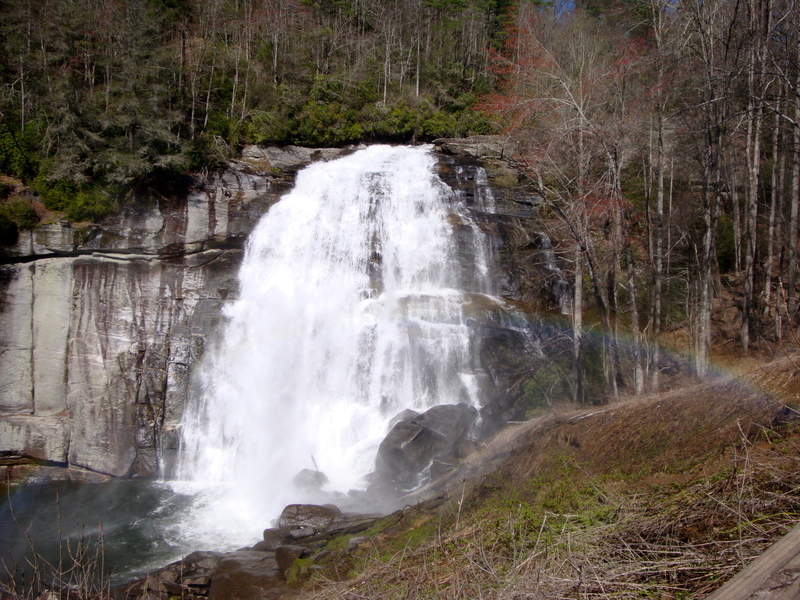 Rainbow Falls has been written with a marker and an arrow to the right. 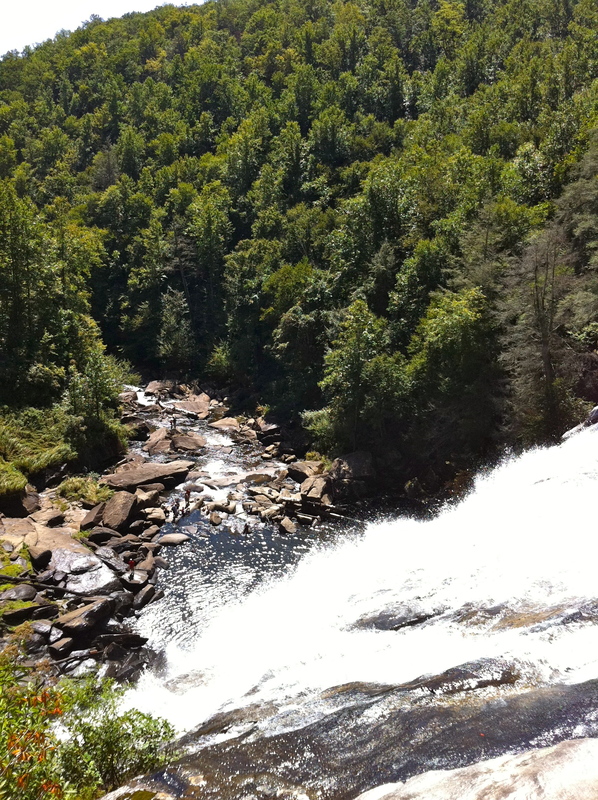 The trail that breaks off to the left here….is the one that takes you down to Stairway Falls. 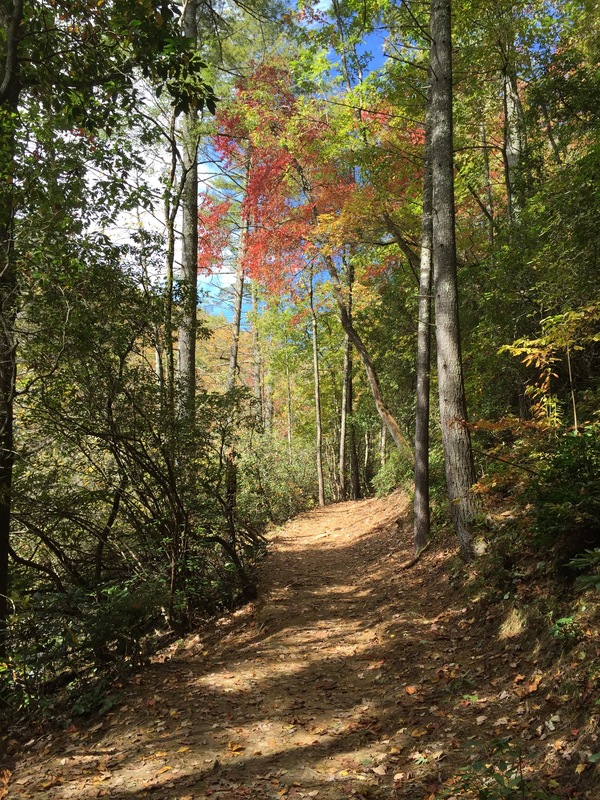 The trail is immediately more narrow, but still in good shape. There appears to have been some maintenance done on it recently. It goes downhill, and in no time, you will be at the top “step”. 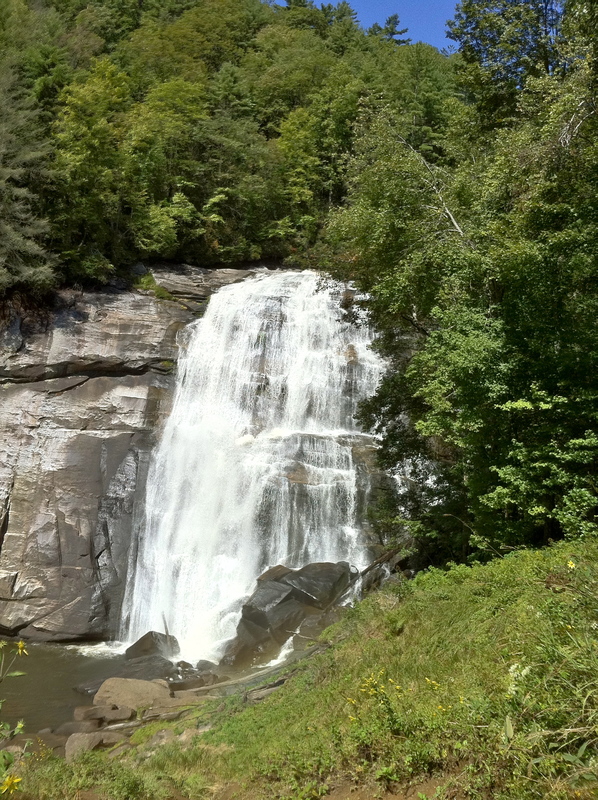 This is the first of five 10 foot waterfalls, one after another. 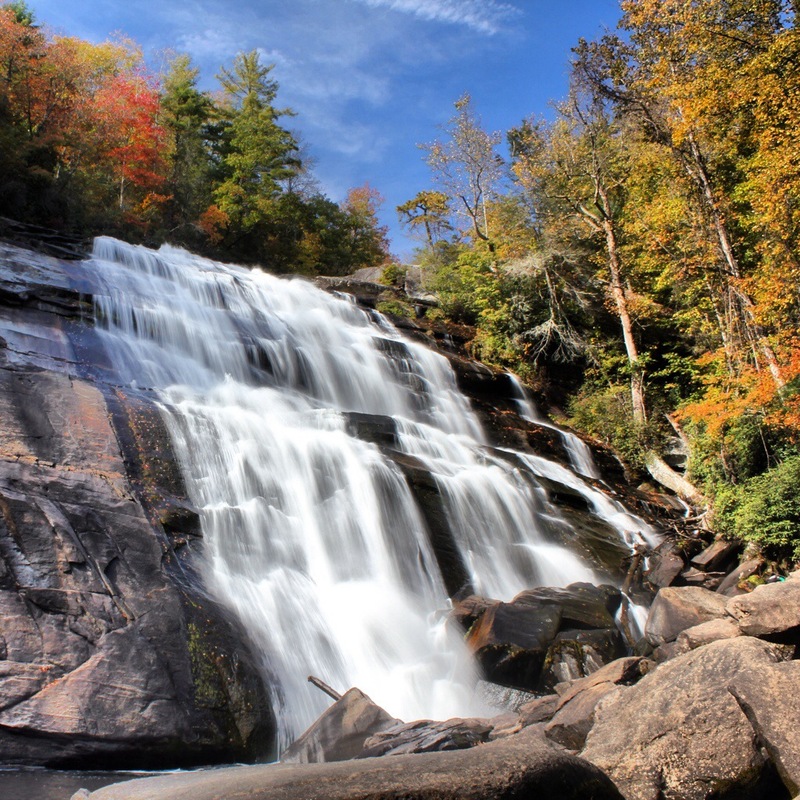 The trail keeps going down to the base, where a number of large rocks and boulders await to sit down, stretch out and enjoy these 5 beautiful waterfalls all working together to form the “Stairway”. I really enjoyed it down here. The water was up on an already high volume stream. 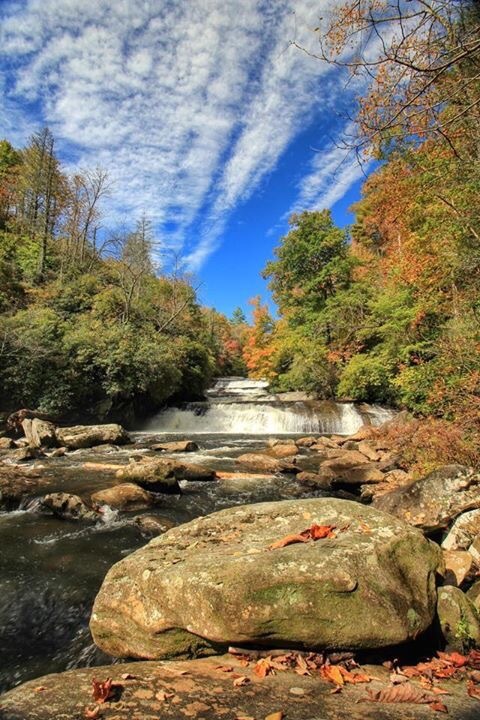 The fall colors and blue sky were marvelous. 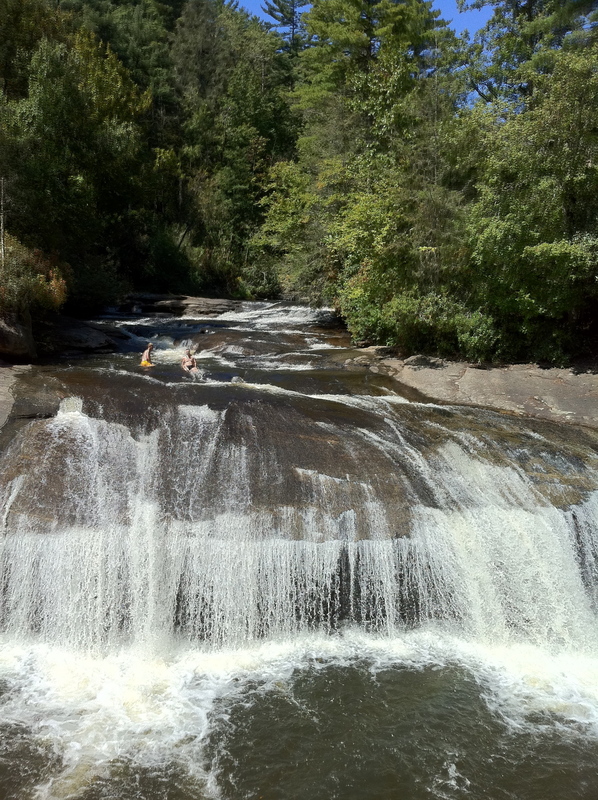 Also, on a crowded Saturday in the park along the trails, I had this entire waterfall to myself to enjoy. 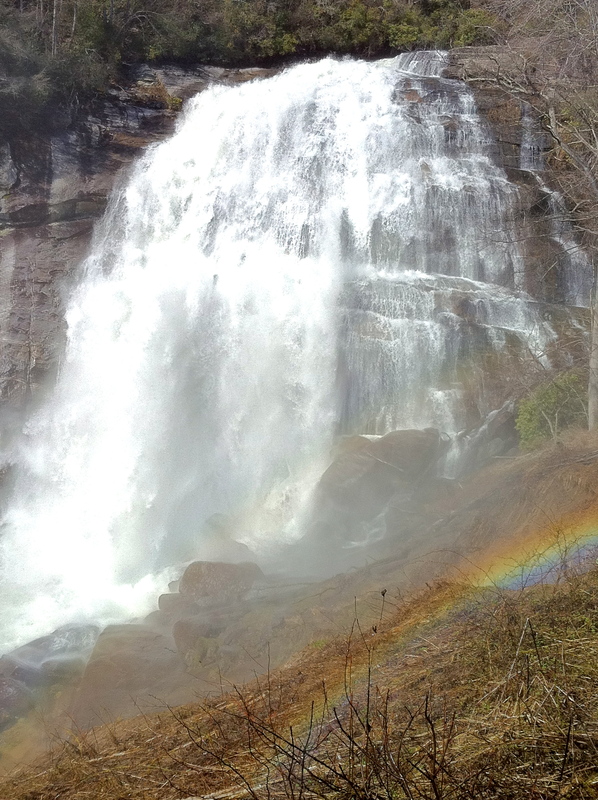 After Stairway, I couldn’t…not see Rainbow Falls. 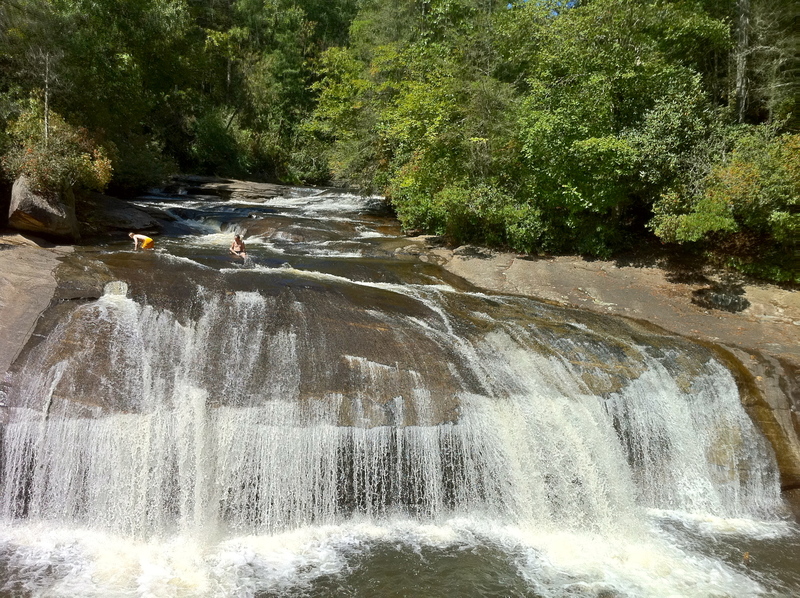 This is after all one of the finest waterfalls in North Carolina. 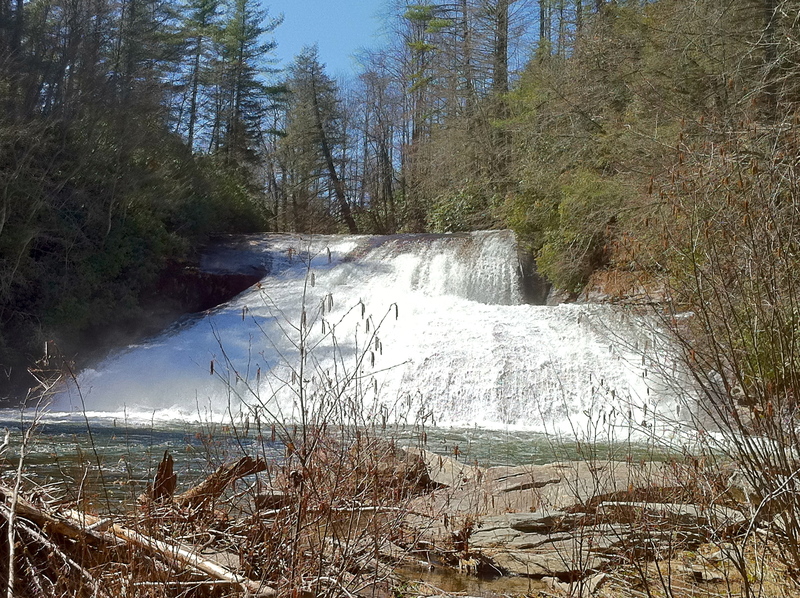 So I met back up with the Rainbow Falls Trail, and kept heading upstream. Once the trail reaches the river, a large campsite will be on the right. Two streams must be crossed, dryly I am happy to report. One is rather large, with big rocks placed there to help make the cross easier. 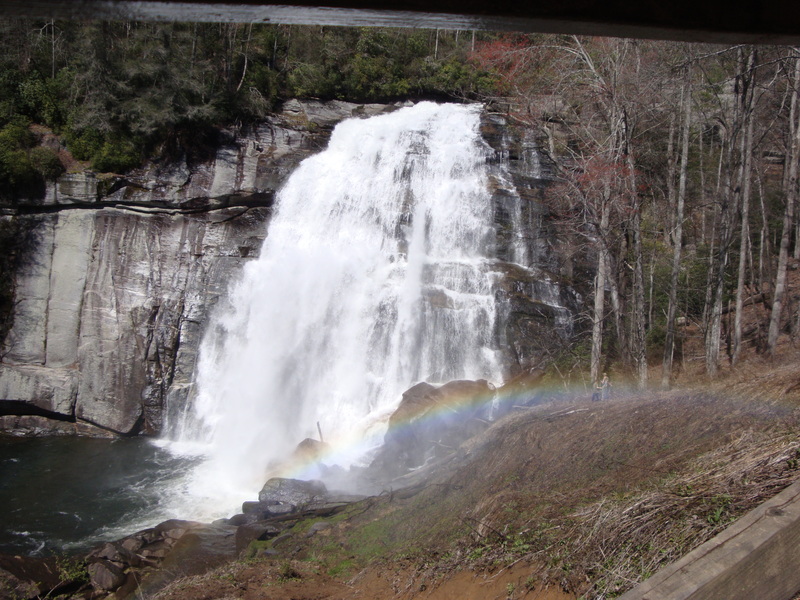 The trail then begins to climb, steeper as you near Rainbow Falls. Nice wooden steps have been added in the last 2 years or so to make this easier and safer. 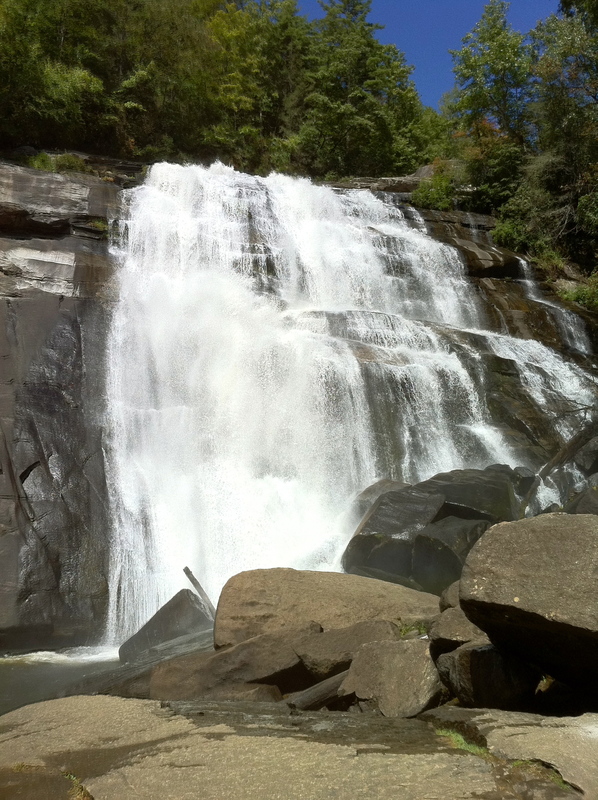 After the steepest climb yet, there it is Rainbow Falls….. 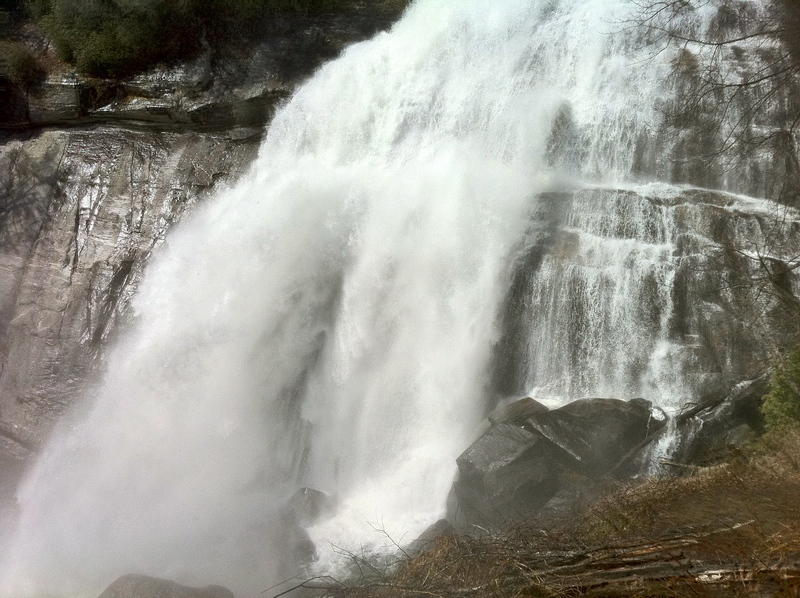 The heavy mist coming off of this large waterfall makes for an amazing site. 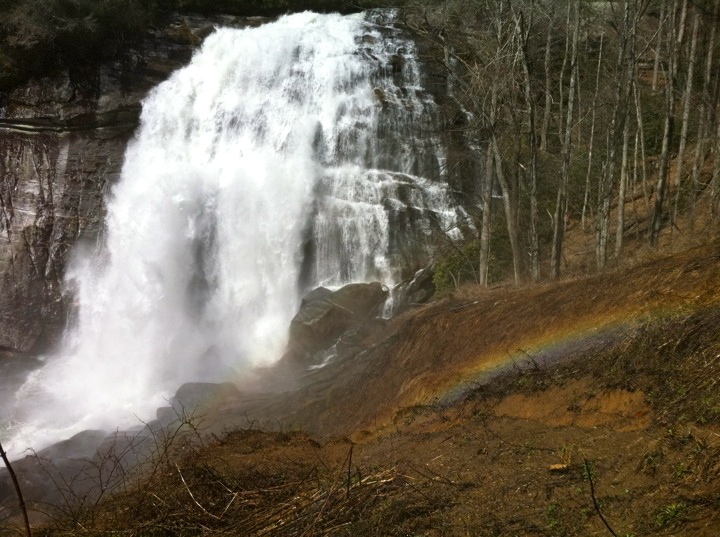 If you get there in time…about 9-11 am, a large rainbow can be visible over the waterfall, on a sunny day that is. I was there around noon, so the rainbow was in the lower right section of the photo, working its way out of the picture as the sun’s angle was changing. 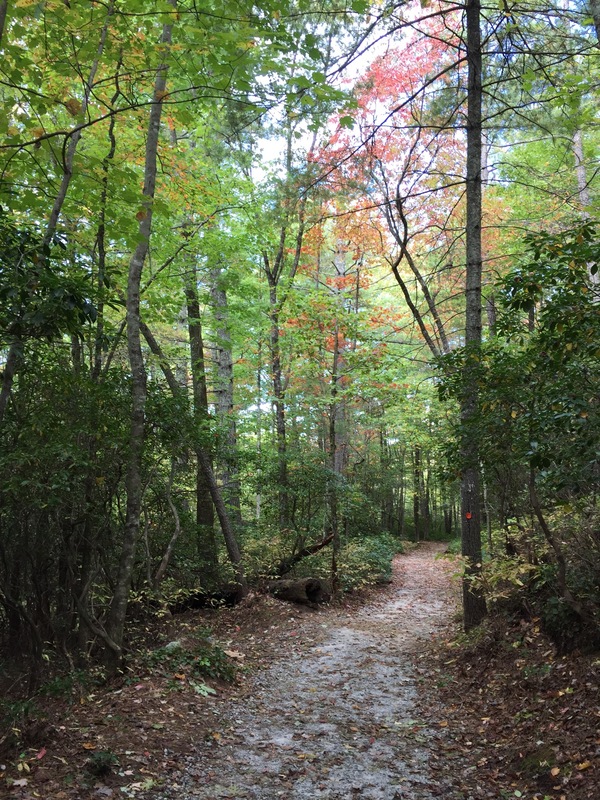 Enjoy the view from the trail, or walk down to the new, lower platform. 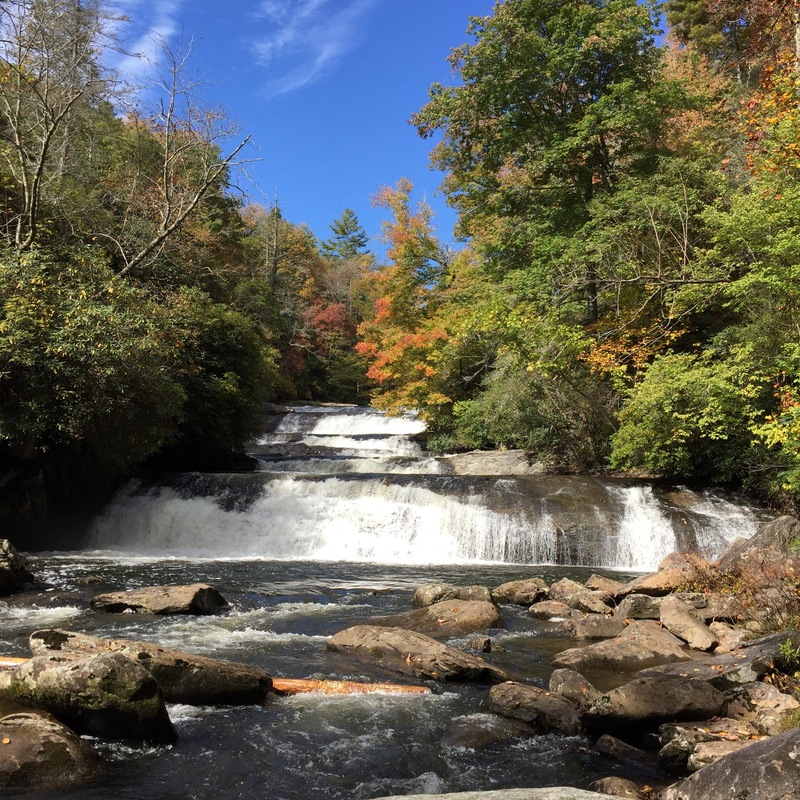 If you still have energy, head on up the trail to the top of the waterfall for some additional views at the top, and also on to view Turtleback and Drift Falls. Here is a map of the hike. 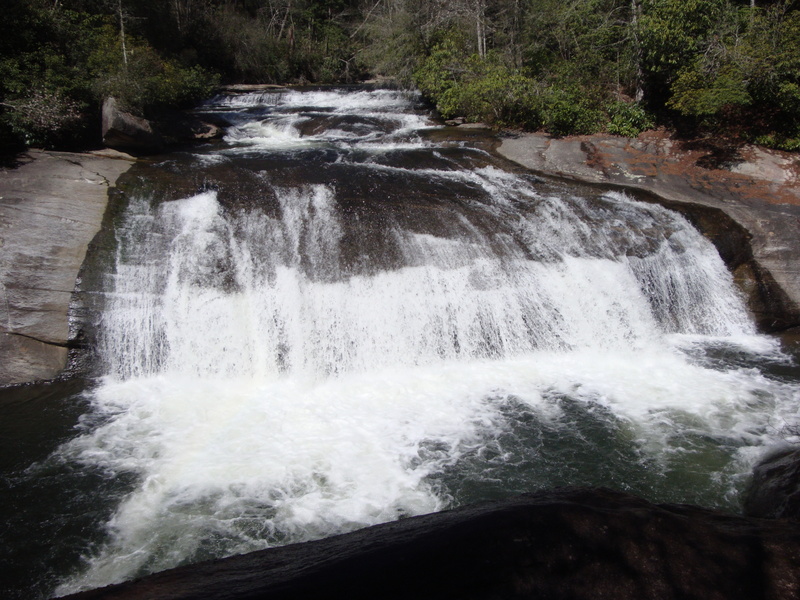 Starting point is in the upper right corner, with Stairway Falls being the first stop on the river, and Rainbow Falls being well upstream.